270 pages | 44 B/W Illus. Qualitative research has exploded in popularity in nearly every discipline from the social sciences to health fields to business. While many qualitative textbooks explain how to conduct an interview or analyze fieldnotes, rarely do they give more than a few scant pages to the skill many find most difficult: writing. That’s where How to Write Qualitative Research comes in. Using clear prose, helpful examples, and lists, it breaks down and explains the most common writing tasks in qualitative research, and each chapter suggests step-by-step how-to approaches writers can use to tackle those tasks. Each chapter features real-world examples from both professionals and students, hands-on practice activities, and template sentences that show qualitative writers how to get started. This text provides the perfect companion for writers of almost any skill level, from undergraduates to professionals. 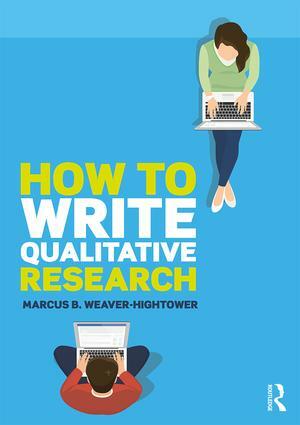 Whether you are writing a course paper, a dissertation, or your next book, How to Write Qualitative Research will help you write clearer, more effective qualitative research. Marcus B. Weaver-Hightower is Professor of Educational Foundations and Research at the University of North Dakota, USA. He has written award-winning qualitative research on gender, education, food policy, and qualitative methods, and he has guided dozens of students through successful qualitative dissertations.